On the 10th of December 1917, the Austro-Hungarian Monarch class battleship SMS Wien (Vienna) was attacked in port at Trieste. All three ships of the Monarch class had been relegated to harbour duties in 1914, since they were obsolete and due to be replaced by the new dreadnought battleships of the Improved Tegetthoff class. Although the ﬁrst Improved Tegetthoff was scheduled to be laid down in 1914, the outbreak of war meant that no work was done on their construction, and so the operational life of the Monarch class was extended. In November and December of 1917 SMS Wien, along with SMS Budapest (another Monarch class battleship) was involved in shore bombardment operations in the Gulf of Trieste in support of the left ﬂank of the Austro-Hungarian army. In the early morning of 16th November the two battleships, escorted by nine torpedo boats, ﬁve minesweepers and three seaplanes left Trieste and opened ﬁre at 10:35 from a range of 10,000 yards. The range was later reduced to 6,500 yards to allow the 15cm secondary guns to join the bombardment. 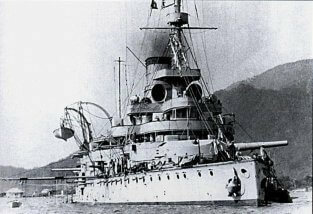 Italian naval units were sent from Venice to attack the Austro-Hungarian force, but they made no serious attempt to interfere with the bombardment, which continued until 14:30, when the force retired to Trieste. During the bombardment, Wien was hit seven times on her superstructure, but did not suffer serious damage, while the Budapest was hit by a single shell below the waterline which failed to penetrate her armour. All the Austro-Hungarian ports were well defended, but Lieutenant Luigi Rizzo, an ex-Merchant Service Captain commanding the small motor torpedo boat MAS 9, had made many reconnaissances of the harbour at Trieste. These had led him to believe that access could be gained through the moles, as long as a way could be found to break through the steel hawsers stretched across them. Powerful cutters, designed to cut through a 4-inch hawser, were therefore ﬁtted to the bows of MAS 9. On the 9th December 1917, the Italian torpedo boats 9 PN and 11 PN left Venice, towing MAS 9 and MAS 13, commanded by Chief Quartermaster Ferrarini. At 22:45, 10 miles from Trieste, the MAS boats were dropped off and quietly made their own way to the harbour. Having reached the harbour, Rizzo climbed one of the moles and listened to the lookouts talking, before returning to his craft to deal with the hawsers. The main 4″ hawser presented little problem, but the six 3″ cables took two hours to cut, as the cutters were not designed to deal with these thinner cables. As the two boats entered the harbour, they had to take shelter from a searchlight in the shadow of the mole. After the searchlight was switched off the MAS boats headed towards the Wien and Budapest. After locating the targets and inspecting them – to make sure there were no anti-torpedo nets, Rizzo ordered MAS 13 to attack the farther ship, while he attacked the nearer one. At about 02:30, Rizzo ﬁred his two torpedoes, and almost immediately was illuminated by a searchlight from the Austrian ship. He was not illuminated for long, though, as his torpedoes found their target and the searchlight went out. Not long after, there were two more explosions, leading the Italians to hope that Ferrarini’s torpedoes had also hit, although in fact they had missed their target and exploded harmlessly. The two MAS boats left the harbour at full throttle, to meet their torpedo boats, and were back in Venice later that morning. The Wien was hit on the starboard side, and assumed a severe list, which counter—ﬂooding failed to rectify. Within five minutes, she had rolled over and sunk. The sinking of the Wien to torpedo attack dramatically illustrated a design weakness in the Monarch class: an armoured longitudinal bulkhead on the centre line. Ironically, this design ﬂaw had been intended to protect the ships from torpedo attack. However, the bulkhead actually led to instability when the one side was ﬂooded. Had the bulkhead not been ﬁtted, the ﬂooding would have been more generally distributed across the hull, leading to a loss of buoyancy, but no list.